My grandmother was always known for her amazing applesauce. She used transparent or “early” apples, the ones that appear in farmers markets here in mid-July when I am typically more focused on peaches than apples! Because, these first-of-the-season apples are so tart, this type of applesauce relies on a heavy dose of sugar. But it is sooooo good. I make it most summers, and those who haven’t previously tried it are always amazed at what this kind of applesauce tastes like. I remember the first time I branched out in the world of applesauce. I made a crock pot version and delivered a container to my grandmother. Her first question, asked so kindly was, “Did you use the early apples?” It was mid-fall, so those apples were long gone. Yet when she tasted it, she gave it her genuine stamp of approval. My latest rendition foregoes sugar altogether, opting for a small amount of maple syrup. 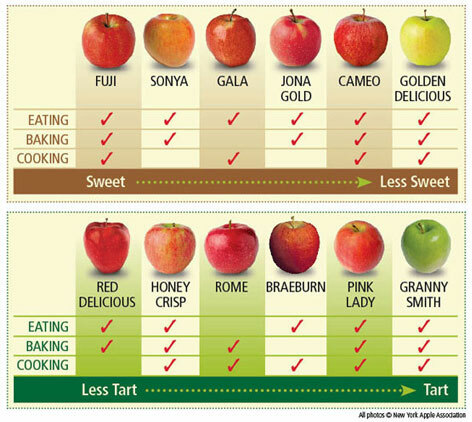 Both options are described in the recipe below along with a handy guide to a variety of apples and helpful equivalents. Using a mix of apples creates extra flavor; incorporating sweeter varieties allows for less added sugar. For an all-natural option, I recently swapped the sugar for maple syrup to positive reviews. Peel, core, and quarter the apples. 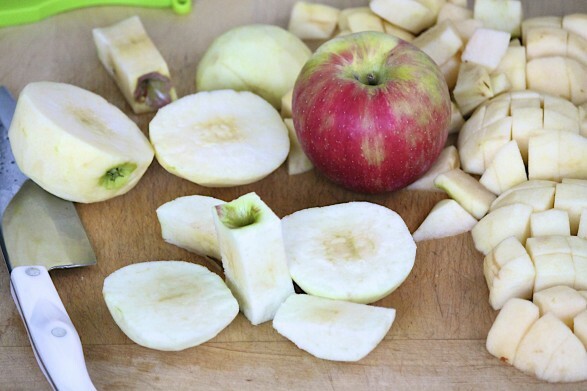 To prevent browning while you are peeling, place the peeled apples in a sink or bowlful of cool water. 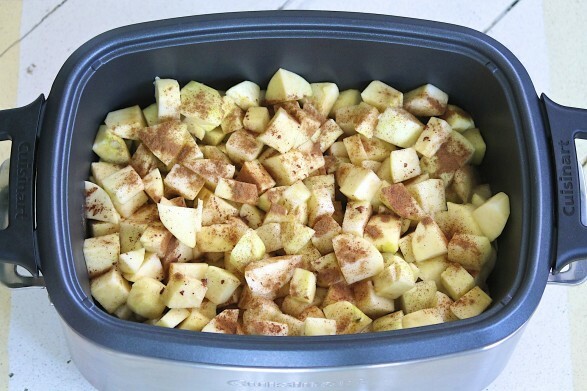 Place the apples, cider, cinnamon, and salt in the insert of a 5 to 7-quart slow cooker. If your slow cooker is smaller, consider making half or three-quarters of the full recipe so as not to overfill your cooker. Cover and cook on high for 3-4 hours or on low for 6-7 hours, or until the apples are very soft. For chunky applesauce, mash the apples with a potato masher. For a smooth consistency, puree the apples in a blender or with an immersion blender. While the sauce is still warm, add the maple syrup. Taste and add more maple syrup to achieve your preferred level of sweetness. Enjoy warm or chilled. Store leftovers in the refrigerator for up to one week. This recipe freezes well, too. This time, I used a mix of Fuji, Jonagold, Rome, and Golden Delicious. These are all sweeter varieties that allowed me to use a mere quarter cup of maple syrup to achieve desired sweetness. An advantage to using maple syrup is that it can be added at the end, after the apples are mashed or pureed. This way, you can truly add to taste. Sugar is best added earlier so the granules fully dissolve. 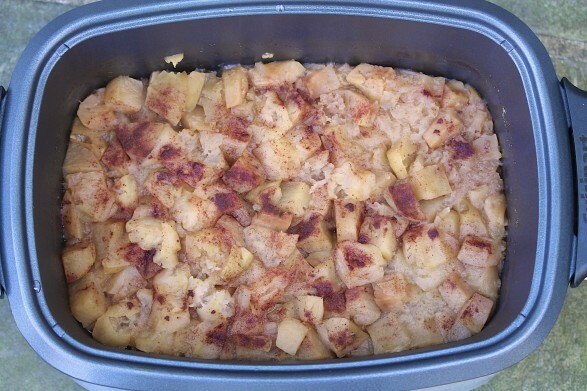 My previous way of preparing was to use a mix of sweet and tart apples, adding ¾ cup sugar at the beginning. Feel free to use this method if you prefer, as it is equally delicious. 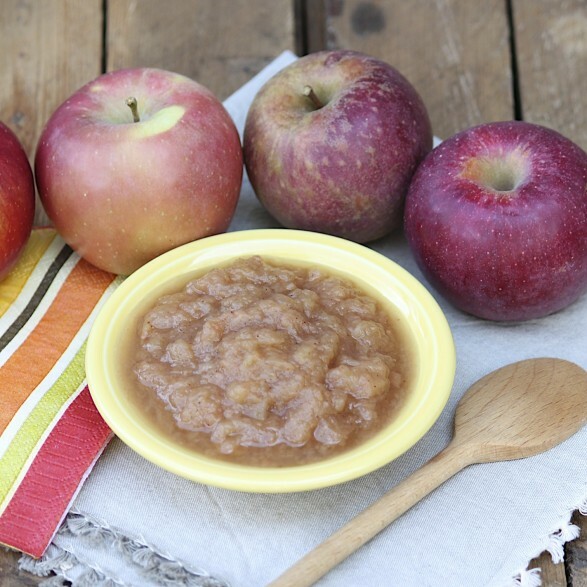 Other good naturally sweet sauce apples include Cameo, Cortland, Gala, and Honey Crisp. Slicing straight down the sides of the core is a speedy way to core your apples. I love home made applesauce I’m going to try this this weekend. Can’t wait to have that aroma fill my house. It does smell good…hope you love it! Thank you, I made this yesterday and tossed in one peach that was cut into the same size as the apples. It was a huge hit! No sugar necessary with my apple varieties! I made your corn, crab and avocado salad last night for dinner and it was FABULOUS! Definitely a keeper recipe in this household! Thank you for sharing. AND I made this applesauce the other day, and it is almost gone! YUMMY!!! Thank you for the terrific feedback on both recipes! Ann I need to try this! it is funny, I have not heard about transparent apples since my mom passed. She always used them for her pie. That brings back wonderful memories. I love a somewhat tart apple. I am going to print out your chart also, that is a great help.. thank you! I am so glad to remind you of that great memory. One hardly hears of transparent apples anymore, but they remind me of my grandmother every time! 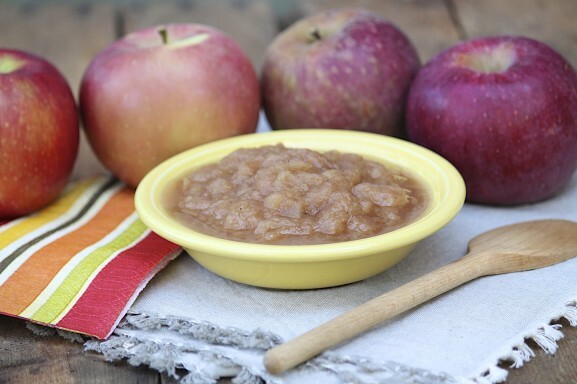 This applesauce recipe is fantastic!!! I think EVEN my “pioneer” mother would have liked it! Great message…I am so happy it got the thumbs up! I made this last week and it was wonderful. My husband said, “This tastes like liquid apple pie!” Your blog has become such a go-to resource for me. Thank you! Your feedback is terrific, Sarah, and truly appreciated!